Grandma, who crossed the Atlantic 101 years ago on the Principe di Piemonte, with three children aged 7 and younger, loved ceci beans (chech-ee), which are also known as chick peas and garbanzo beans. As a callow youth with an unsophisticated palate, I hated them. To me, they were mealy and dry and I never tasted them again until about 10 years ago, when I had a ceci-based soup at a restaurant in Vagliagli, in the Chianti district of Tuscany. After that, I began to appreciate their texture, flavor and adaptability to a variety of uses. 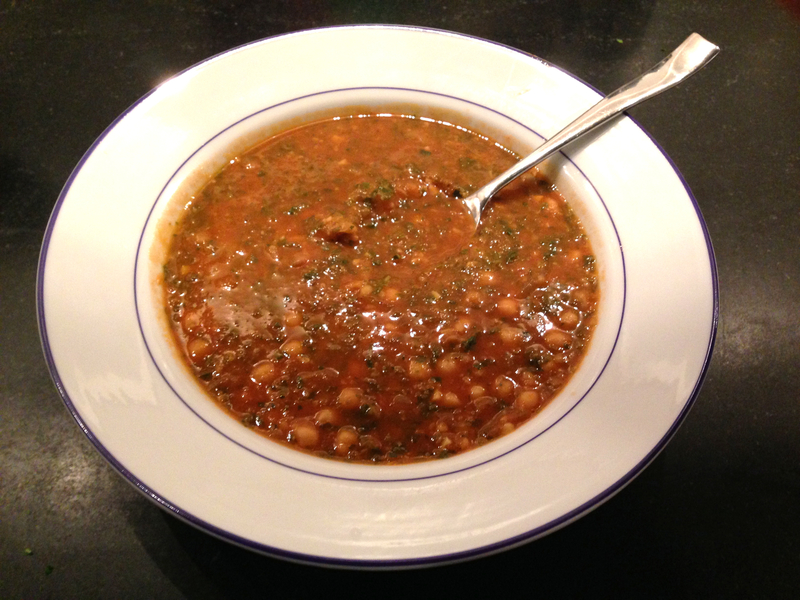 One such use is in Garbanzo Bean Soup. Recently, I had occasion to have lunch with some friends at the Indian Road Café, in my old neighborhood of Inwood in northern Manhattan. I ordered a delicious shrimp sandwich, which came with a side salad of chick peas dressed with pesto. Having some pesto sauce remaining from the batch of Uncle Fred’s Homemade Pesto Sauce that I had made several weeks ago, as well as several cans of garbanzos in the pantry, I had an epiphany and headed out to the market to pick up a red onion, cucumber and lemon. The first of two of those items were visible in the salad as well as the chick peas and pesto, but I had no idea about the lemon, it just seemed the right addition.